Charles Volkert and Judy Hissong explore key factors that legal professionals value in their work environment and ways legal organizations can use this knowledge to engage, motivate and retain employees. As the demand for legal professionals with specialized expertise rises, law firms and legal departments are increasingly concerned about losing top employees to other job opportunities. As a result, retention efforts as well as strategies to enhance staff satisfaction are becoming front-burner issues. In this episode of The Robert Half Legal Report, attorney Charles Volkert, senior district president of Robert Half Legal, and Judy Hissong, principal at the Legal Leadership Institute, explore key factors that legal professionals value in their work environment and ways legal organizations can use this knowledge to engage, motivate and retain employees. They also discuss legal staffing options being used to help manage rising workloads, boost productivity and enhance retention efforts. 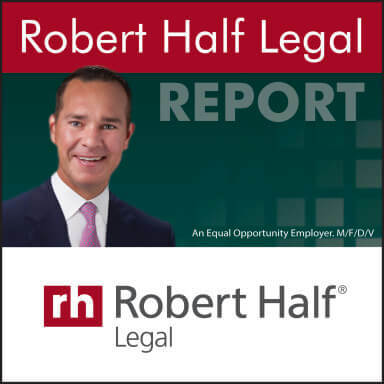 Intro: Welcome to the Robert Half Legal Report where we discuss current issues impacting the legal profession, related to hiring, staff management and more, with leading experts in the field. Robert Half Legal provides lawyers, paralegals and support staff, the law firms in corporate legal departments on a project and full-time basis. The Robert Half Legal Report is here on The Legal Talk Network. Charles Volkert: Hello everyone and welcome I’m Charles Volkert, Senior District President of Robert Half Legal and the host of our program. Our guest today is Judy Hissong, Principal at the Legal Leadership Institute and President of Nesso Strategies. Judy is a certified legal manager and an accredited executive coach. She consults, speaks, trains and coaches on leadership development, strategic planning, workplace engagement, and other key business skills. As a former professional athlete she also writes and speaks on the importance of health and exercise and the value of work/life balance. Welcome to the show, Judy. Judy Hissong: Thanks Chad. I’m pleased to be here. When I hear that introduction I sound a little — I feel tired, I guess, is the way to say that, I’m often reminded of how much time I’ve been in the industry and the different places I’ve been is two decades of time, either managing law firms or partnering with them, and I’m very excited to be here and part of this conversation. Charles Volkert: Well, time does fly when we’re having a good time, Judy, and again, thanks for joining me today, I know our audience is going to look forward to your expertise and advice as we move through the show. Today we’re going to be discussing Legal Staff Retention, why law firms and legal departments are increasingly focused on this topic, the key factors that legal professionals value in their work environment and strategies legal organizations are using to engage, motivate and retain employees. We’re going to also explore legal staffing options that help address rising workloads, reduce employee stress and enhance long term retention efforts. So a jam-packed agenda, Judy, and we might as well get right to it, and maybe as a starting point let’s talk about why staff retention has become such a hot topic for the legal world and legal organizations? Most recently in a study nearly 40% of lawyers we interviewed express concern about losing top talent, top legal performers to other job opportunities, and more than 60% of the lawyers also reported it’s challenging to find skilled legal professionals today. Judy, what circumstances are you seeing driving these concerns? Judy Hissong: Well, I think far and away the biggest one is generational. We have a lot of very experienced, very seasoned folks in the industry, and then we have a lot of folks who are just entering, and the folks in the middle are not as large of a community, and so, I think one of the biggest drivers or the biggest causes of that kind of concern is simply we don’t have enough experience out there. Couple that with there are few other things that play into that in my mind, one of them is, there’s really a trend towards specialization, and I mean, I think for a second at the staff level, even the evolution of the legal secretary, which was a conversation you and I had a really long time ago now, the demand for their level of expertise is so different now than it used to be, and then at the attorney level where there’s so much transition, either in the mergers and acquisitions or in the lateral movement, it really has created concern about retention. Charles Volkert: Yeah, I couldn’t agree more, I know our clients, it’s a constant topic and we actually address with them when they’re looking for talent we sort of take a step back and say, what could the firm, what could you all have done to retain top talent, because if we find you somebody that fits your need, it’s really important to get out of the gate quickly with a retention program, and so, with the increasing demand for particular legal expertise and knowledge, we certainly are seeing more aggressive to your point merger and acquisitions, recruiting tactics from one firm to another, we know from experience that losing key talent not only adversely affects client service, but also the productivity of the organization and law firm, and it can impact morale as well as prompting other staff members to explore opportunities what are you seeing the biggest impacts are in the legal space when it comes to retention? Judy Hissong: Well, first I want to acknowledge your spot-on with — that it becomes a domino effect at some level, and in fact, I’ve had this conversation just in the last couple of weeks about how do we retain our talent once we lose one key player, and whoever that is, and so, it’s really the loss of knowledge can immediately equate to loss of finance with respect to business and books of business, it also I think to your question, one of the most important steps is to really consider, are we doing anything in the space where the word would be a stay interview or a check-in? Have we created a culture where people can speak up before they start looking for something else? If they’re not feeling something is right where they are, how can they ask for support or growth, or even training, which I know a lot of organizations consider a cost, I think that cost of training significantly outweighs the cost of replacing somebody who’s a top talent. Charles Volkert: Well, I couldn’t agree more. One of the interesting things that we see, Judy, in the marketplace right now is candidates coming to us saying, listen, “I’m only getting an annual review or biannual review”, our top clients that are retaining their best people are literally having weekly, bi-weekly or at least monthly type of career discussions performance-related discussions with their folks within the firm or the corporate legal department and they’re retaining their top talent. So I think your points are really right on target. What factors beyond, maybe more open communication or increased communication are you seeing from influencing retention within law firms or corporate legal departments? Judy Hissong: Well, I think you – I mean, I was fortunate enough to fly on a plane not too long ago with a woman who I think I’m going to guess was in her mid 30s and we struck up a conversation, she was on her way to meet her team, she works virtually, meet her team for her quarterly evaluation and she is a senior level executive with Google and she credits her promotions and quick growth in the company to the ability of her team giving her feedback. What one of the things that we have not done well in the legal industry is allow feedback to be 365, so I will feedback on myself first and then I’ll look at all levels around me and receive it, and that transition has happened in the corporate sector much more readily. It is an opportunity for law firms. Now I know some of the mega firms are starting to consider how they can do this, I don’t know anybody that’s doing it right now, but I’ve certainly had conversations with some of them to say how could we roll this out, what would it look like? So, when we’re talking about top talent, if we’re talking about at the staff level we have to figure out ways to keep them engaged, and there’s no requirement for promotion to set goals. How do we go about creating a path for our people to grow their skills, and an easy one in my mind is an example about the evolution of the legal secretary, and now a lot of organizations, a lot of law firms are operating in teams, corporate departments too, and the evolution into a team environment requires different skills because we’re really talking about someone who’s been dedicated to serve one, two, three people prioritize their work and is rewarded on the success of that relationship. When we shift into teams, we’re now talking about rewarding someone who can delegate to other teammates when they’re overloaded and who can step up and take from other people when overloaded that’s not been the place in the law firm for a long time. So there’s a huge amount of potential there to grow skills to engage people differently and to retain them because they’re very actively learning. Of course compensation matters, I mean, I’m kind of leaving that as a foregone conclusion, maybe I shouldn’t, but these other things that will help people continue to grow is going to keep their engagement and what we know about our youngest generation in the workforce is that they’re looking to grow, so let’s keep teaching them. Charles Volkert: Well, I couldn’t agree more, Judy, and that growth doesn’t have to come in the title. I think a lot of folks often think that it does. A lot of the other things we hear are continued work flexible type options, and one of the things that we say is that doesn’t mean work less, it just means work from wherever you are, whenever you can to make sure you get the job done, and I think a lot of people say, work flexible means working even more, because you always have that mobile device on and it’s hard to put it off. Judy Hissong: Right, right. We’ve seen that explosion recently of creating new policies for that flexible work stuff, right? Yeah. I am with you. Charles Volkert: Right. So, I found it very interesting in a Nesso Strategies blog entitled “Rubber Meet Road, Road Meet Rubber” which I loved, you noted that within a space of a few weeks you’d had significantly more conversations about firms losing top talent than in any of the recent years leading up to that, and you discussed how workplace or office culture plays into employee satisfaction. Can you provide our listeners some deeper dive or additional insights into that article? Judy Hissong: Sure, and thanks for bringing that up. I will say, even since that was published I’ve had a couple more conversations about what we’re doing and how can we do it, and I’ll make it short and simple. Culture is created by what you reward, so to me it’s either aspirational or perspirational, and maybe I get that from my athletic background. Am I sweating in it right now or am I aspiring to do it? I can lay down at night and dream of having a championship ring of any sport ever to actually get up and go do the work is a different thing, and so, when we get clear and we actually look around and say, one of my core values as a law firm, let’s say I espouse this, is respect. Well, then am I doing that in all the corners? And I think right now an additional piece of that is very gender — there’s a big gender push, so how are we treating our women versus our men in our legal settings, and diversity, which is coming partly from the corporate world. They’re looking — corporate councils are looking for diverse law firms to partner with. If I say the cornerstone in my culture is respect and then I treat people differently, that’s going to be problematic over time, or if I say that my core value is respect and then I opt out of things, depending on whether or not I “feel” like it or want to be available, then I’ve got conflicting statements happening and people aren’t going to hang around for that. You may aspire to have something as a value point that helps develop your culture, but what really happens with culture is you encourage things by tolerating them, whatever they are, and I think we’re seeing, maybe you’re seeing too — I know I’m seeing, there’s finally some desire to have the tough conversation at the partner level when we’ve been encouraging things that are not successful over the long haul. I think that piece of it is going to help with some of these retention and engagement issues. Charles Volkert: I agree with that, I mean, being true to the values and making sure that it’s a top down, it’s one of the reasons that I’ve been at Robert Half as long as I have Max Mesmer, our CEO with the lead principles of ethics first, often talks about with the leadership team, we have to live those values and make sure that it permeates throughout the organization, and I think a lot of companies have done that, and certainly firms, but as law firms look to operate maybe more efficiently, effectively, similar to corporation structure. I think to your point those conversations are happening at the very highest levels with the partners. In another post you referenced a Gallup survey that reported that a majority of employees don’t quit jobs, they quit their managers, and you underscored the value of strategic investment in strong performers. Can you offer our listeners advise to legal managers on ways they can invest in their employees for really getting the maximum result out of them and keeping them very happy? Judy Hissong: Sure, I think and you can speak to this too, but I would say that any time I have turnover the cost to replace that person is roughly equal to their compensation, between the training and all of the steps involved in getting someone up to speed, and so, what are you doing with your training dollars? Because I spend a lot of my time in training space and I’m talking with firms about training, a lot of times the examples I hear are the person who needs the “most” work, and I would really like for you, legal managers listening to this, to consider how you can develop training for your high potentials, consider how you could create programs or opportunities for those folks that are in your path either to partnership or simply to higher levels in your staff site, it doesn’t matter to me, either way your training programs ought to be beneficial for your top performers at least as much if not more so than whoever those least common denominator folks are in your environment. Additionally, I will say, as we’ve gotten more team-centric in the legal sector we’ve developed into practice groups and I know that’s not new but it’s still new in terms of evolution, do we train our practice group leaders on not only the tenets of leadership, but also on how to be a team player, how to run a team, how to be inclusive? That piece of it to me feels like an opportunity area that would reap great benefits in bottom line efficiency and profits, do we have ways to connect partner compensation to behavior? I know we like to tie it to client generation and to productivity in terms of billable hours, but can we also consider partner development, how are we creating the next generation before we get in a desperate situation with succession planning, and maybe even consider what are these managerial skills? Are we focusing on how folks can become a pipeline to the management committee? I think all of these are opportunities that don’t have to take away from the bottom line, they’re an investment in the future and create a nice path for the firm’s success overall. Charles Volkert: Well, that’s a great discussion, Judy, and we’re going to dive into that a little bit deeper in the remaining part of the show, but now it’s time for a quick break. Advertiser: To find, hire and retain the best legal professionals, it’s critical to have a sound hiring strategy in place. Robert Half Legal works with law firms in corporate legal departments to create effective staffing plans that could adapt to changing workload levels, realize significant cost savings and improve the overall management of human resources. We offer a wide range of resources to assist hiring managers and job candidates, including our annual salary guy industry-leading workplace research at valuable interactive tools. For more information, call us at (800)870-8367 or visit HYPERLINK “http://www.roberthalflegal.com” roberthalflegal.com. Charles Volkert: Welcome back to the Robert Half Legal Report, I’m Charles Volkert and joining me today is Judy Hissong, a certified legal manager and President of Nesso Strategies. Judy, before the break we were talking about factors legal professionals value in their work environment and how workplace culture can significantly influence staff retention? Can you suggest ways that legal organizations can use this knowledge to engage and motivate employees and strengthen their long term retention of their employees? Judy Hissong: Well, I think one of the pivotal points, and we touched on this briefly with respect to the flexible work that’s now happening in the world, one of the pivotal points is building trust, and especially if I’m not face-to-face with you, how do we create strategies that allow for face to face for trust to happen? An email that I send to you generates a tiny bit of trust, and if it has typos, it erodes that trust, if however you and I are on Skype face-to-face or any other platform where we actually can see each other’s eyes, the nonverbal part of that grows significantly. So that’s one element that we really need to think about in my opinion. That’s not adding anything to the bottom line expense-wise, I mean, or detracting from the bottom line, but it’s definitely helping folks feel included and building trust with their employer that may not be on site with them. The next thing is, to really be clear about what our culture is, and walk it and talk it and breathe it and encourage it, and carry it forward; that to me naturally means do we have a good ascension plan? So succession planning is how I get out the door, ascension planning is how I climb up, right? And we right now are so focused on succession planning, I think we’re missing an opportunity to say, you, young associate, here are the steps for you to get from A to B and B to C and so on and so on, and build that into something that looks like a quarterly review if not more frequently. Now, I say, “quarterly” because I think that’s a big step for people who are doing it annually. I would love for those conversations to be carved out and set aside and monthly tracking of goals and measuring where we’re going. That’s much more of a corporate approach and I realize the industry is not quite there yet, but I do think ultimately that’s going to be beneficial. Now I’ll add to that by say, how do we celebrate? How do we reward? And under the guides of having a healthy workplace more and more folks are wanting ways to care for themselves. So celebrate with walks or have meetings that include walks. These all definitely create more motivation on a day to day basis and people talk about it. Sit in a cafe and listen to people talk about where they work and why they love it, and what you’re going to hear are things like we have a wellness room or we get to go work out or we have a trainer or we have a meditation cycle at certain times of the day. All of those things, I know some of them are pretty far-fetched for the legal industry, but they’re coming, so when are you going to be ready for them? When are you going to embrace them? I think the last thing I want to be sure to point out is that notion of a stay interview, and what I really mean by that is, can I sit down with someone and talk about what’s going well without having any documentation around it at all, simply to build trust, build relationship, determine employee satisfaction levels, and obtain information that can help me make the next initiative or connect the dots to another tactical move that the firm could do from a people perspective that would be more out of the box. Charles Volkert: Well, Judy, those are all great best practices and I’m sure we’ve got the wheels turning and our listeners heads on some of those out-of-the-box ideas to your point that are coming probably fast and furious to an office near all of us soon if they’re not already there. I want to just back up, you mentioned that big word earlier here in the discussion, “compensation”, and we certainly — and I don’t want to necessarily gloss over that because it does remain a key motivating factor for legal professionals, and quite honestly, still one of the best lines of defense against losing talent though it certainly has been to some extent minimized on the initial offer stage as they’re looking at a lot of these other factors you’re talking about, it’s essential that legal organizations monitor salary trends and ensure that compensation practices really measure up to their other competing law firms or organizations. In particular, in and around the hot busy practice areas in the demand or the up-and-coming areas like data privacy and the continued growth of compliance and others, and it’s certainly a good strategy to maintain salary levels that are quite honestly a bit higher than your competitors are off or other incentives such as attractive bonus structure. I think the Robert Half Legal Salary Guide which we publish annually is an easy-to-use resource on legal compensation trends and lists salary ranges for more than 100 legal positions in the legal field, and while we’re on the topic of compensation, in today’s competitive hiring environment we’re seeing a lot of counteroffers, Judy, and is that something from a retention and a strategy perspective that you endorse? Judy Hissong: Not really. I’ll back up and say, I think that the Robert Half Salary Guide is a fantastic resource and folks should consider that as a starting point in their process, and then I want to go back to your question and say, when I simply counter money with money I haven’t really dealt with whatever is underneath that, and granted, sometimes it is money, sometimes I really do need more money to do whatever with in my life, but the majority of the time, it’s a temporary fix and the person is still going to leave at some point. In fact, I was in conversation yesterday where a counteroffer had happened for retention and it didn’t keep the person, so then after the counteroffer was made the real story came out of all of the things that had been in the way and the firm ended up very frustrated because they threw their hands in the air and said I wished we had known, we would have — and off they went, so that’s to me points back to the whole idea of having regular interactions that are more stay interview focused. Because there’s lots of things that happen when you offer — when I counter another firm’s offer of you generally you’ve already told some folks you’ve got the offer, you’ve already done some other things that that now if you actually stay, all the people around you are going to have a sense that I offered you more money, and everybody around you is going to have bad feelings toward the firm, towards you, toward whatever, and it may start actually the same cascading effect we talked about with exits, where other people start looking just to basically hold the firm for more money. So I don’t think it’s a very viable strategy and I really don’t think it’s a good idea. I will say exit interviews become really important because if truly it is about the money then it’s something worth knowing what sold them on the next place, that’s just the competitive marketplace, so maybe I’m advocating for interviews on all sides now that I listen to myself, but that notion of really talking to people all along the way prevents money from being the only factor to change. Charles Volkert: Agree completely. I mean, the common theme that I keep hearing from you, Judy, and we see this as well with all of our recruiters and their discussions with clients and candidates is more communication, the better throughout the course of your entire career with an employee is going to prevent the need for a counteroffer in many circumstances, and many of the studies that we see within 6 to 12 months after accepting a counteroffer, that individual is no longer there in 80 to 90 % of the cases, and that should say something both to the employee as well as the employer; so very good information. We consistently find in our research that long workdays, obviously some of the pressures that go along with billable hours and managing client expectations, are among the top stressors for legal professionals, not only can stress impact productivity, it certainly can be a major factor, Judy, and an employee’s decision to give notice. Can you make some suggestions to our audience on steps that legal organizations can take to reduce workplace stress and enhance morale? Judy Hissong: In listening to your comments I think you hit on probably the biggest one, which is communication. If I feel like I understand what’s happening in the firm I’m less stressed and I certainly am not running around looking for information that I don’t have about what’s going on. So I think that’s a really basic one. We operate in a 24/7 world, so I think it’s really important to be mindful of what you’re doing with your email at night, how often you’re logged in and where’s the delineation between personal time and professional time. I think inside these teams and groups that are now forming, it’s really creating an environment where I can ask for help and people are comfortable hearing that and knowing that they can chime in and do stuff and it doesn’t mean anything, I think that’s really important, and of course, there’s the other side of me, that’s the personal trainer in me and that spends a lot of time talking about health and wellness, and again, I would encourage how can you get breaks and get people into fresh air, and I know not every climate allows that, but as much as possible, that’s a big one to reduce stress. Charles Volkert: Those are great and helpful strategies I think for all of us to keep in mind. I’d also mentioned the use of flexible staffing and consultant models to address rising workloads. One of the things we continue to see with law firms as well as our corporate legal departments is the ability to bring in very skilled consultants and project professionals to be able to alleviate some of those very long hours, keeping an eye on your full-time employees and realizing if they’re burning the candle at both ends may be better to bring somebody in for a week or two or even a month or so to help in a trial prep versus burning out your best people that you really need for the long term. Can you offer any tips on how legal professionals can reduce stress and improve work/life balance themselves, Judy? Judy Hissong: I think that’s a great point that you’re making there and it’s being comfortable communicating that, look, I need a break or it’s time for a break or even if there is the opportunity to have some other help on a project then stepping back a little bit in terms of what you’re doing and how you’re contributing. I also would say have conversations about what flexible work arrangements mean. I think part of the fear of that environment is people don’t know what to expect, they don’t know that you’re working when they don’t see you, so being able to talk about that and understand that. I also think that there’s some kind of inherent unspoken stress about if you’re an attorney in a law firm you better be on a partner track or else, so I think it’s time to start exploring what other kinds of positions exist and corporate departments have done a pretty good job of this in my opinion. I guess basically just non-traditional lawyering help, what would that look like, and to some degree that project work is stepping in, I think there’s more opportunity for that, and if I’m drilling down into the very personal level, I mean, let me just say very simply, move your body everyday, move it differently today than you did yesterday, turn off your electronics at night, at the same time save some time for you to just be before you go to sleep. Those are incredibly simple and yet we struggle with them, all of us. Charles Volkert: Couldn’t agree more, I know you’ve got a desk that goes up and down, Judy, I know a lot of our folks in our offices do, we use headsets, we walk around. I love your comments on getting some fresh air out there, and you can tell that there’s other organizations within the legal industry. One of the reasons our consulting practices grow. so much are there are those lawyers, those legal professionals that don’t want the partnership track, but want to remain a real key component within the legal world and help companies achieve their goals or handle issues, and so, I think as law firms and corporate legal departments look at ways sort of these non-traditional roles that many corporations and law firms are now beginning to have is really, really important. Well, it looks like we’ve reached the end of our program, hard to believe already, Judy, but it was a great discussion and a big thanks to you for your comments and expertise today. Before we close I’d like to let the audience know how they can contact you and where they can obtain more information. Judy Hissong: Thanks Chad. You can subscribe to the blog at HYPERLINK “http://www.nessostrategies.com” nessostrategies.com, you can email me at [email protected], and you can find training, ideas at HYPERLINK “http://www.legalleadershipinstitute.com” legalleadershipinstitute.com. Charles Volkert: Excellent. A ton of great resources there, Judy, and I know many of listeners will probably be reaching out to you directly. Our listeners can reach me at HYPERLINK “mailto:[email protected]” [email protected] and you can visit the Robert Half Legal website for additional information on legal careers and management resources, including our latest salary guide for legal professionals at HYPERLINK “http://www.roberthalflegal.com” roberthalflegal.com. Thanks again, Judy, and to our audience for listening today, join us next time on the Robert Half Legal Report as we discuss important trends impacting the legal field and legal careers. Outro: The views expressed by the participants of this program are their own and do not represent the views of nor are they endorsed by Legal Talk Network, its officers, directors, employees, agents, representatives, shareholders and subsidiaries. None of the content should be considered legal advice. As always, consult a lawyer. Thanks for listening to this podcast. Robert Half Legal connects the most highly skilled candidates with the best positions in the legal profession. Join us again for the latest information in the next edition of the Robert Half Legal Report here on the Legal Talk Network.